Sepia rendering of One on One Commercial Center in Gurgaon. Monochrome watercolor technique. "The project itself is in the form a large, elegant piazza framed by six graceful structures ranged along its sides. The piazza will be the focal point of restaurants and retail outlets on the ground floors of the surrounding buildings. This will be a public place, where people will throng even after office hours because of the lively environment and the food and beverage attractions. ... Soaring 100 metres into the sky, the tower will be among the tallest buildings in the National Capital Region and will command uninterrupted panoramic views over Delhi and Gurgaon. 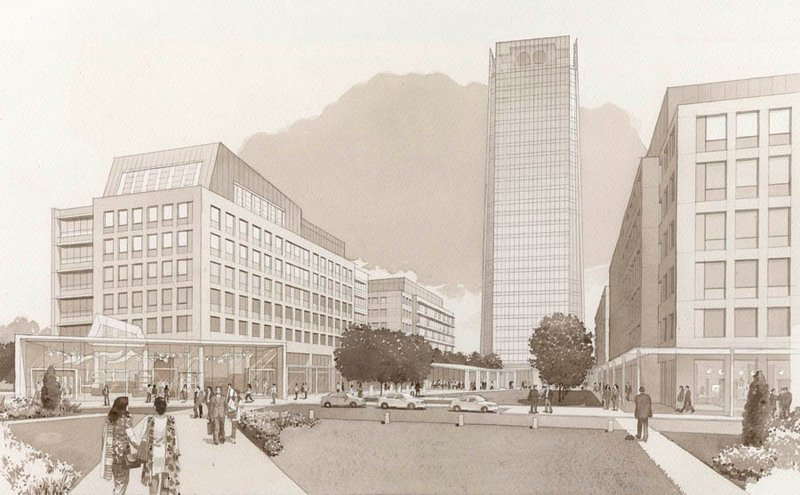 The tower shall be located at one end of the space outlined by the lower buildings. This imposing formal arrangement will add to the grandeur and iconic image of the project. A large proportion of the facade will be of glass, and the tower will light up the night sky like a dazzling lofty beacon. The bar and lounge planned for the rooftop of this tower will be a signature feature of One On One and become a mustvisit icon of Gurgaon as well. At the other end of the piazza will be a ten-storey commercial space, acting as a gateway to the project."